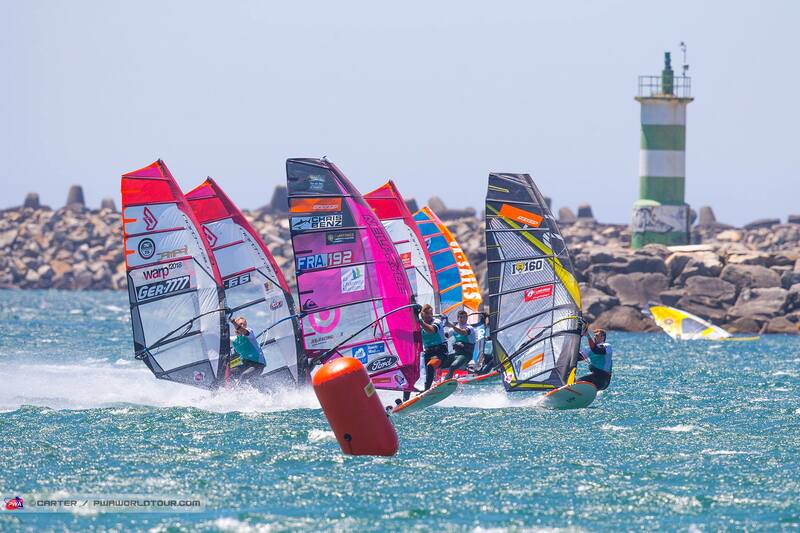 Viana do Castello continues to impress after another extremely windy day provided world class slalom conditions, which saw the sailors reaching for their smallest sails - 5.0-5.6m - at some point during the day as Day 2 of the 2018 Viana PWA World Cup provided pretty much everything you could wish for on a competition day with upsets, crashes and brilliant overtaking manoeuvres featuring heavily throughout. After an exhilarating day of racing, Delphine Cousin Questel (Starboard / S2Maui) and Cedric Bordes (Tabou / GA Sails) lead the way after the opening two eliminations. Delphine Cousin Questel has been unstoppable so far this season with two event victories from two events as she aims to win her 3rd Women’s PWA Slalom World Championship and she continued that rich vein of form today. The 26-year-old couldn’t have asked for a better start as she ends the opening day of slalom in Portugal with a perfect record - earning bullets in both eliminations completed. Cousin Questel excelled in the extreme conditions and blew the rest of her rivals away. If she continues in the same mood then it’s very difficult to see anyone stopping her from marching to world title No.3. Reigning world champion - Sarah-Quita Offringa (Starboard / NeilPryde / Maui Ultra Fins) - made her first appearance of the season on the race course having been absent in Japan and South Korea and ends the day ranked 2nd after finishing 3rd in Elimination 1 and 2nd in Elimination 2. So, while Offringa admitted that she may not have enjoyed every moment of today’s hairy racing today she heads into tomorrow as Cousin Questel’s closest rival. However, Guilbaud will be Boyd by today’s results - a solid 5th and then an excellent 3rd - especially when you pair them with current world No.3 - Marion Mortefon’s (Fanatic / NorthSails) results - 10th and 7th - which throws the battle for the final place on the overall podium wide open. Mortefon unexpectedly missed out on the opening Winners’ Final and was then prominently placed in the second final of the day, but was badly impeded by teammate - Jenna Gibson’s (Fanatic / NorthSails) - free flying rig at the first mark, which meant she dropped from being a frontrunner to the back of the pack. Luckily with a windy looking forecast, there promises to be plenty more racing, but Mortefon will be aware that she is under pressure in her quest to achieve back-to-back end of season podiums. Elsewhere, Esther de Geus (Fanatic / NorthSails) has made a solid start to the event and is ranked 5th ahead of Jenna Gibson and Lilou Granier (Starboard / Severne), who are tied in joint 6th. The New Caledonian was on point with her starts all day and was on course to win the opening elimination before wiping out on the outside mark. Cedric Bordes heads the event rankings at the end of the opening day of the slalom. The Frenchman produced a stunning comeback in the first race to deny Ben van der Steen (I-99 / Gun Sails) a bullet. Bordes came flying out of the final gybe and then overtook the Dutchman down the final reach - before finishing 5th in Elimination 2 - giving him a 3.3 point lead over current world tour leader - Matteo Iachino (Starboard / Severne / Shamal Sunglasses), who qualified for both Winners’ Finals - finishing 6th and 3rd respectively. Antoine Albeau (RRD / NeilPryde) missed out on the opening Winners’ Final of the day as he and Pierre Mortefon (Fanatic / NorthSails) - current World No.2 and 3 - were eliminated in the semifinals. Albeau went on to win the b-final, while Mortefon finished 3rd before the two heavy weights went head-to-head in another pulsating final. In the Winners’ Final of Elimination 2, Albeau held the lead into the first buoy and that is usually an ominous sign. However, Mortefon produced an outstanding first gybe to overtake the 24-time world champion on the exit. Mortefon’s lead was short-lived though with Albeau - who was on 6.4m in the final - powering back into first place as they approached the third. Mortefon tried to take the inside line, but after a slow exit, Albeau pulled away to claim his first bullet of the event, while Mortefon took home 2nd. That leaves Albeau in 2nd place and Mortefon in 6th at the close of play. Meanwhile, Tristan Algret (Starboard / Severne / Chopper Fins) enjoyed a bright start to the event as the 24-year-old qualified for both finals today - where he recorded 4th and 6th place finishes. That leaves the man from Guadeloupe in 4th place and firmly in contention for chasing a maiden podium. Ben van der Steen enjoyed his best day for quite sometime after finishing 2nd in a race that it looked as though he was going to win - before winning the b-final of Elimination 2 to end the day ranked 5th and looking much more like the man who finished 4th overall in 2014. Fellow countryman and Birthday boy - Jordy Vonk (Fanatic / NorthSails) - missed out on the Winners’ Finals for the first time this season as he was eliminated in the quarterfinals and then the semifinals to end the day 19th. However, there still isn’t much pressure on Vonk, who can discard this result if needed with 3 top 8 results from the first 3 events already. In the howling winds, Antoine Questel (Starboard / S2Maui) looked blisteringly quick and that pace equated into the Frenchman enjoying his best day of the season as he qualified for his opening Winners’ Finals of 2018. Questel was one of the most consistent performers last year but has been off the pace until now. The 33-year-old will start tomorrow ranked 7th. Marco Lang (Fanatic / NorthSails) also enjoyed his best day of the season so far, which saw him qualify for his first Winners’ Final of the year where he finished 7th, while recording a 12th place in the opening race. The Austrian had been suffering from a virus since South Korea, but this initial showing here illustrates that he may be on the verge of returning to full fitness and displaying something close to the form that saw him win the 2017 Sylt PWA Grand Slam. 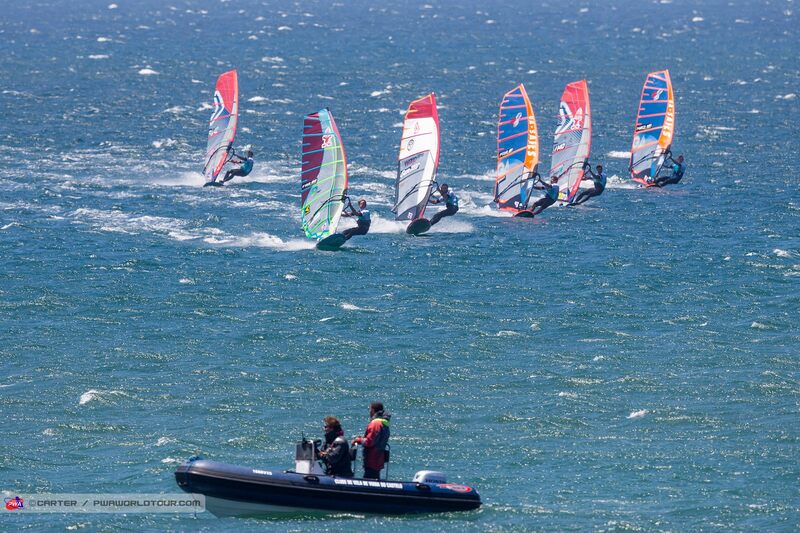 The top 10 is currently completed by Cyril Moussilmani (RRD / Severne) - 9th - and Mateus Isaac (JP / NeilPryde). The Frenchman opened his account with an excellent 3rd place before suffering a narrow quarterfinal exit. Meanwhile, Isaac looked set to be in contention to qualify for his second winners’ final of the day as they approached the first buoy, but exploded on entry to end his chances. Elsewhere, Bruno Martini (RRD / Point-7) qualified for the top 16 in both races, while Pascal Toselli (JP / Loftsails) and Finian Maynard (I-99) find themselves a little off the pace - with the latter winning the recent event in Costa Brava, while Toselli claimed 2nd. They finish the first day of slalom ranked 12th and 13th. Meanwhile, Ross Williams (Tabou / GA Sails / Shamal Sunglasses), who has been one of the top performers over the last few seasons with overall results reading 4th, 3rd, 4th (2015-2017 ) endured one of his worst days in recent years as he suffered a quarterfinal and then a shock second-round exit to find himself in a lowly 24th place. Something clearly isn’t quite right - especially given the fact that today offered Fuerteventura-esque conditions - particularly in terms of wind strength - and Williams has not finished outside the top 3 there in the last 3 seasons. Williams isn’t the only big name off the early pace though as Arnon Dagan (RRD / NeilPryde) - 8th overall last year - and Sebastian Kördel (Starboard / GA Sails) - 10th - are currently well down the rankings as well - 30th and 36th - with Dagan in his own words saying: “going fast but finishing last”. The wind looks set to not only continue tomorrow, but get even stronger according to the locals, so make sure you don’t miss any of the action by tuning into www.pwaworldtour.com. The sailors will meet again at 10:30am for both the Freestyle and Slalom Skippers’ Meetings - while the first possible start is 11am (GMT+1).